Trump's auto tariffs: Can EU avoid new taxes? Trump has not adopted a conciliatory stance ahead of the meeting, tweeting his reaction this week to an EU antitrust ruling that went against Google (GOOGL). 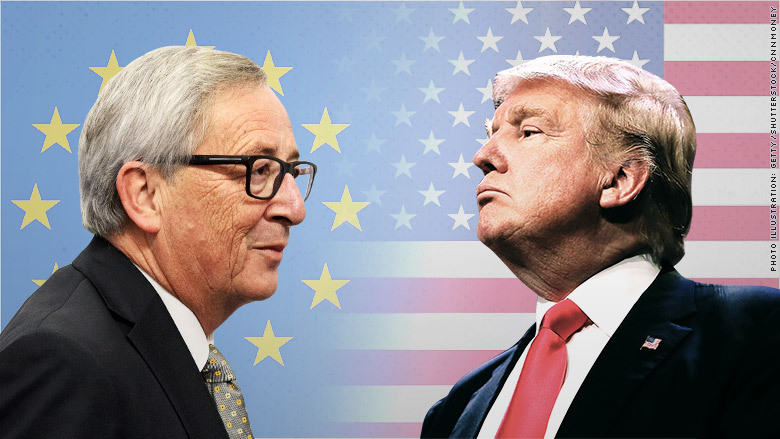 Juncker is meeting Trump at the White House on Wednesday. About 35% of the US trade deficit is attributable to auto imports, according to analysts at UBS. The European Union, which is home to Volkswagen (VLKAY), BMW (BMWYY) and Mercedes owner Daimler (DDAIF), exports over €50 billion ($58 billion) in cars and auto parts to the United States each year.